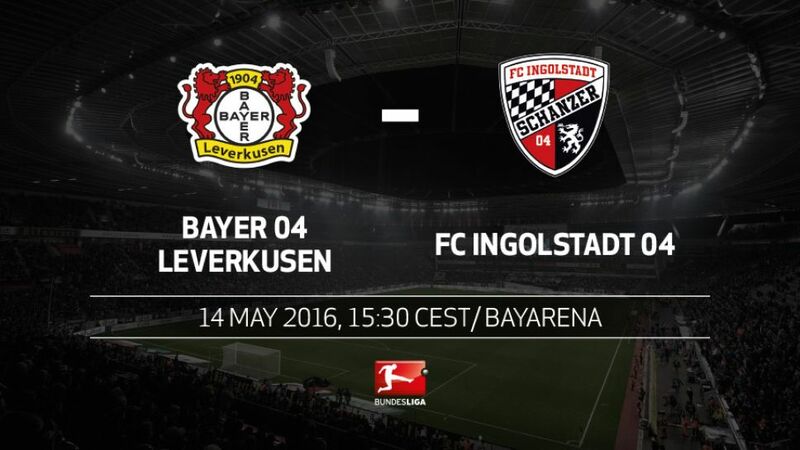 Bayer 04 Leverkusen play host to FC Ingolstadt 04 on what should be a festive final day of the season at the BayArena (kick-off 15:30CEST/13:30GMT). Leverkusen's recent seven-game winning streak may have come to an end on Matchday 33, but they will nevertheless end the season in third place and with a ticket to the UEFA Champions League next season, which is certainly something for Die Werkself to celebrate. Ingolstadt have silenced the critics this season by securing safety with several games to spare, and they will be out to enjoy the occasion on their final trip of the season, and head coach Ralph Hasenhüttl's last game before joining RB Leipzig next season. Javier ‘Chicharito’ Hernandez proved to be Bayer 04 Leverkusen’s match-winner once again after netting the only goal of the game in a 1-0 victory over FC Ingolstadt 04. In their 37th Bundesliga season Leverkusen have finished in the top three for the tenth time.Die Werkself have finished second five times and third five times.This is the seventh consecutive year that Leverkusen have finished in the top five. They are the only Rhineland team to have managed that.Between matchdays 22 and 25, Leverkusen only took one of a possible 12 points. Leverkusen were eighth as recently as Matchday 25.Seven victories and eight weeks later, Leverkusen have qualified directly for next season's UEFA Champions League group stage, for the 11th time overall and the fourth time in a row.Stefan Kiessling has scored against 16 of the 18 teams currently in the Bundesliga. Only SV Darmstadt 98 and Ingolstadt are missing from his collection.Ingolstadt have only conceded 39 goals. This is the lowest number of goals conceded by a promoted team since FC Bayern München let in just 38 in the 1965/66 season. Ingolstadt have only conceded eight goals from set pieces.